SUBHEAD: Spreading contamination into populated areas through this flooding is a significant health risk to the Japanese people. Image above: Still frame from video below of flood waters destroying a rural home. . Mainstream media in the US and in Japan is simply not doing its job. Last week a serious typhoon hit eastern Japan creating flooding that has not occurred for at least 50 years. Before the typhoon hit, Tokyo Electric assured the Japanese that the Fukushima Daiichi power plant was safe. As the typhoon lashed in Japan, Tokyo Electric admitted that the drainage pumps at Fukushima Daiichi failed and radioactive water once again entered the Pacific Ocean. Also, Tokyo Electric admitted that only several dozen bags of previously collected radioactive material have also washed away. As far as mainstream media is concerned, the extent of the radioactive contamination as a result of this typhoon was limited to these relatively small releases directly on the Fukushima site. Nothing could be further from the truth. Fukushima Prefecture is very mountainous and became highly contaminated after the triple meltdowns. Those of us who have studied the disaster at Fukushima Daiichi have noted for years that an extraordinary amount of radioactive cesium, strontium, and other radioactive isotopes from three nuclear meltdowns has spread hundreds of miles from the site of the disaster. The rain that lashed the east coast of Japan flooded that radioactive material to new locations downhill. It is obvious to scientists, but not the mainstream media in Japan, that areas that have been previously decontaminated by the Japanese are now contaminated again by the flooding. These newly contaminated areas include villages that had been evacuated when the disaster struck four and a half years ago that the Japanese government has allowed its population to return to. Fairewinds has said it before and we’ll say it again. Follow the money! Tokyo Electric and the Japanese government do not want to reevaluate the spread of radiation as a result of this latest typhoon. It will cost too much. The expense to really clean up after this disaster is unimaginable. 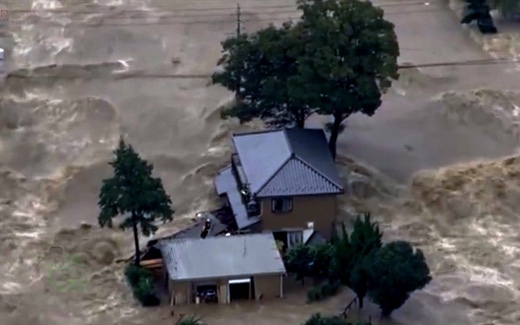 Spreading contamination into populated areas through this flooding is a significant health risk to the Japanese people that the Japanese government refuses to accept. For the next three hundred years events like this typhoon will reoccur until all the radioactivity released during the Fukushima Daiichi disaster is finally washed entirely into the Pacific Ocean, not just from the Fukushima Daiichi site but from all the tributaries and rivers in the mountains that enter the Pacific ocean. It’s time for the Japanese and American mainstream media to hold Tokyo Electric and the Japanese government accountable to reevaluate the spread of radioactive contamination as a result of last weeks typhoon, and the dose effect to their population from the flooding. Video above: Arnie Gunderen of Fairwinds Associates presentation on Japan typhoon flooding contaminating large areas with radioactivitiy. From original article. energy [r]evolution. It can be done! Is Stock Market Too Big to Fail?